I was lucky enough to hear Patricia Polacco speak at the Mazza Museum Fall Conference 2013. My notes from her talk are sparse. I remember just listening. Hanging on to each of her words. 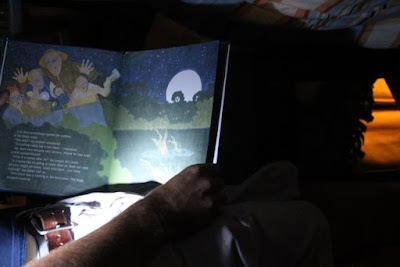 She spoke of Mr. Falker, The Keeping Quilt, the importance of the arts in schools, and more. I remember crying. She has a way of doing that to me, to everyone who reads her books. I urge you to visit the children's section the next time you are at your library. Find Patricia's books. There will be many. The Junkyard Wonders is my favorite. Pick one of them. Her books are unlike any others. I did write down one thing in my notes that day. 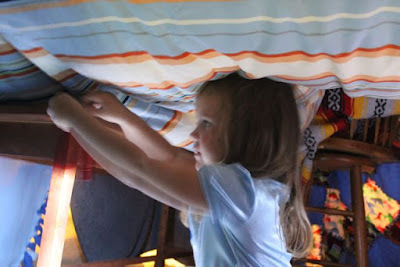 She suggested making a tent with a blanket. Lots of pillows. Maybe some peanut butter crackers like she loved when she was a child. No electronics. Some books. A flashlight. She said, "You will be somewhere magical." "In the summer, in the backyard, we would put on a circus, our poor dogs and cats would be dressed up and paraded down the streets in our radio flyer wagons, while a band of three kazoo players walked in front of us, lead by a grand drum major! And how about those wonderful running games that were invented on the spot? All that needed to happen was a large group of children dividing into opposing teams. 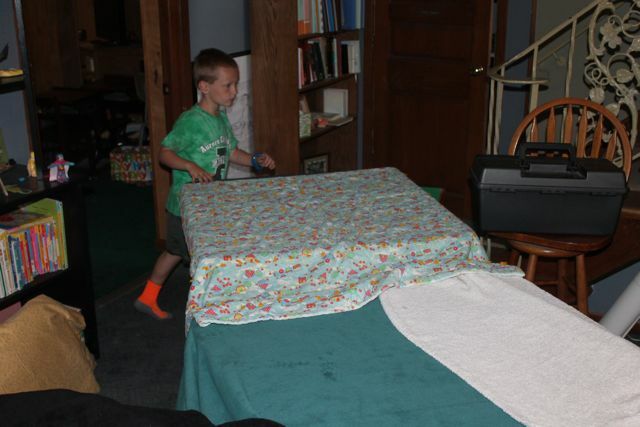 Games like 'Red Rover Come Over', 'Mother May I', 'Simon Says', 'King of the Mountain', 'Kick the Can', and some version of 'Buck Buck or Leap Frog', and of course the old standard, 'Hide and Seek' and 'Ollie Ollie Ox and Free'." 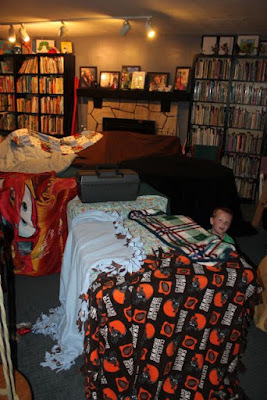 "We also use to rip all the sheets and blankets off the beds, drape them over tables and chairs, safety pinned together, making an amazing maze of tunnels and forts. 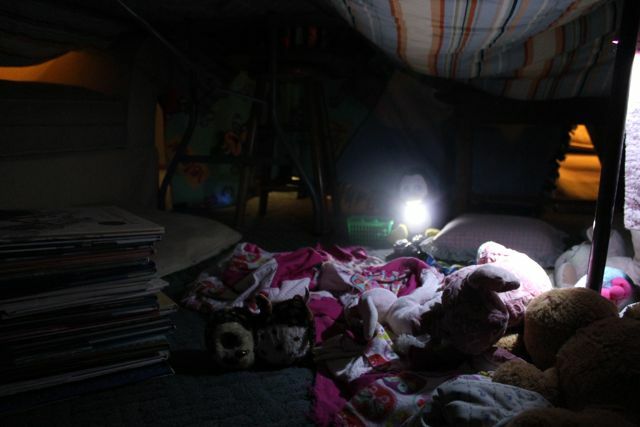 We would fill these tents with crackers and peanut butter, flashlights, cushy pillows, and tons of picture magazines, comic books, flash cards, and board games." (Facebook January 28, 2015). I have been wanting to make a tent out of blankets to celebrate Patricia's birthday with my children ever since I wrote it down. This year it finally happened. I thought the best place to make our tent with blankets was in our basement library. I brought down three card tables and a larger table to build our tent. We also had the table and chairs from our library. 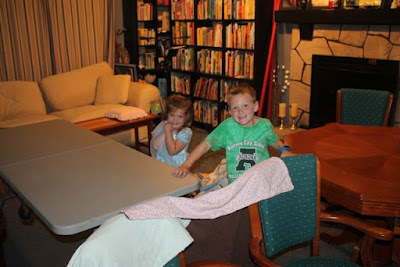 My son worked on covering the tables with blankets. 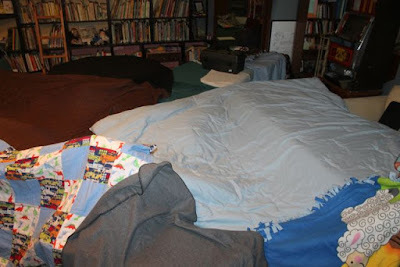 I have always thought we had too many blankets in our house. Today, however, I was thankful for having so many. Our tent was finished. It took 45 minutes to build! A view from inside our tent. Plenty of blankets. Plenty of pillows and stuffed animals. Plus a stack of Patricia's books. 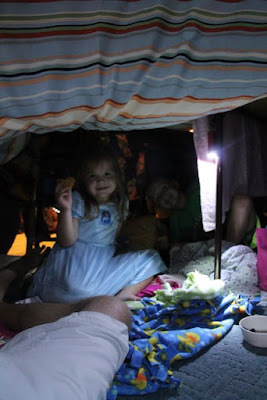 My daughter came up with the idea of hanging flashlights from the tables and chairs. 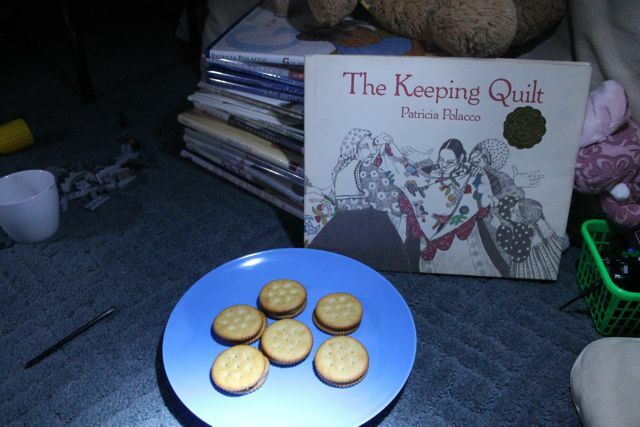 Of course we had peanut butter crackers for a snack. The blanket-tent is still up in our house. I think it will be up for many days to come. They even slept in it one night with their older sister. 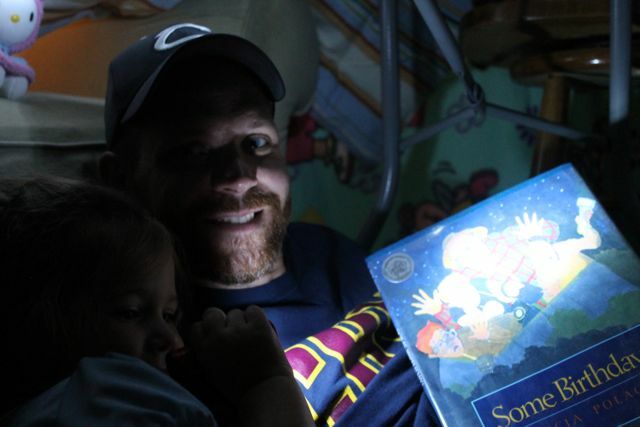 We read Some Birthday inside the tent. It was a tiny bit scary and fun to read with the flashlight. They were so proud of their tent. 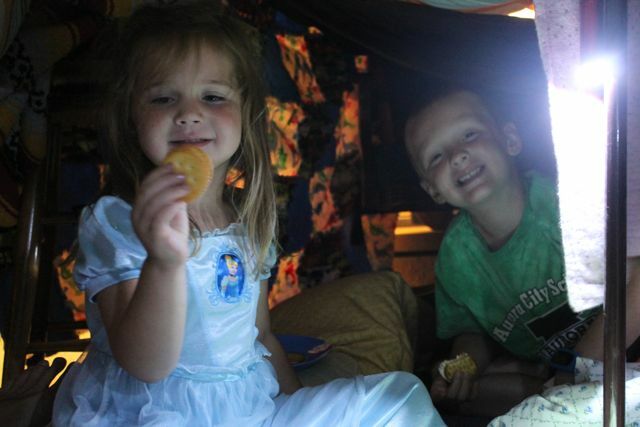 Each time a new friend came over I heard them say, "You have to come downstairs and see our tent." Patricia was right. It was magical. Patricia has two new books coming out later this year, The Mermaid's Purse, (October 4, 2016) and Because of Thursday (October 18, 2016). Both are available for pre-order!